The Tale of Mr. Jeremy Fisher, like Peter Rabbit, began life as an illustrated letter to a young child. It was written when Beatrix Potter was on holiday in Scotland where her father and his friends enjoyed fishing expeditions. Mr. Jeremy has a day full of the worst fisherman's mishaps when he sets out to catch minnows for his dinner. To ask other readers questions about The Tale of Mr. Jeremy Fisher, please sign up. Recommends it for: Beatrix Potter fans!! For my entire life, I have been reading Beatrix Potter's works and I had enjoyed most of the ones I had read! 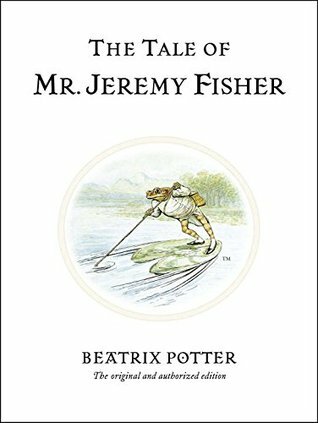 Now, I had picked up an old classic from my childhood, “The Tale of Mr. Jeremy Fisher.” In this tale, Mr. Jeremy Fisher, a distinguished frog, begins having the adventure of a lifetime when he goes out to fish for minnows for his dinner. “The Tale of Mr. Jeremy Fisher” is a delightful tale that every child will enjoy forever! There once lived a frog named Mr. Jeremy Fisher who lived in a For my entire life, I have been reading Beatrix Potter's works and I had enjoyed most of the ones I had read! 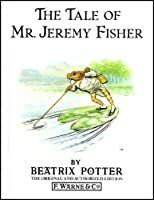 Now, I had picked up an old classic from my childhood, “The Tale of Mr. Jeremy Fisher.” In this tale, Mr. Jeremy Fisher, a distinguished frog, begins having the adventure of a lifetime when he goes out to fish for minnows for his dinner. “The Tale of Mr. Jeremy Fisher” is a delightful tale that every child will enjoy forever! There were many different versions of this cute little tale that I have read, so it was interesting to read the original version of this tale. Beatrix Potter has definitely done an excellent job at both writing and illustrating this wonderful tale of a determined frog's pursuits in catching minnows for his dinner. 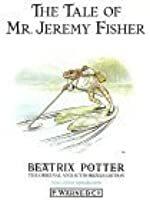 Beatrix Potter's writing is extremely cute and interesting as Mr. Jeremy Fisher is shown to be an extremely distinguished animal character as he is extremely intelligent as he is always thinking of strategies to catch a minnow for his dinner and he is always determined to catch a minnow no matter how troubling the situation gets. I also loved the creative way that Beatrix Potter uses some name puns on the characters, mainly Mr. Jeremy Fisher's friend Sir Isaac Newton, who is named after the popular figure, Isaac Newton. 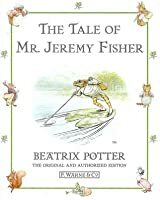 Beatrix Potter's illustrations are extremely cute and realistic as the backgrounds are magnificently detailed as you can see luscious green pond reeds surrounding Mr. Jeremy Fisher and also the pond water looks extremely beautiful, especially during the scenes where Mr. Jeremy Fisher sails his boat on the water. My favorite images in this book were of Mr. Jeremy Fisher himself as he is brown and small and he clearly looks distinguished with his white coat and black shoes. Parents should know that the scene where Mr. Jeremy Fisher confronts a huge trout might scare smaller children as they might worry for Mr. Jeremy Fisher. However, this scene is extremely brief, so older children might not notice this scene too much. Parents should try to comfort their children about the trout scene and make sure that their children can handle this scene. I've never heard of Jeremy Fisher and I loved this little story. It had a surprise even for me. The kids found this a fun little story too. The nephew loved the frog pictures. Jeremy Fisher is a frog and he spends a day fishing. I love the art in this one too. Great story. Worth picking up. In a thrift store recently, I found more Beatrix Potter stories that we have never read. This is brilliant children's literature. When a nine-year-old is challenged to narrate it, and a three-year-old giggles along fully engaged with the story, you know you've got a winner on your hands. Three cheers for Jeremy Fisher! And three cheers for butterfly sandwiches with ladybird sauce! Beatrix Potter's books always appealed to me because food was always involved. I grew up fervently believing in rabbits and mice and frogs having well stocked larders within their homes. And the tea! Always a hot cuppa waiting on the table for the protagonists when they completed their adventures. The Tale of Mr. Jeremy Fisher comes complete with food, adventure, friends...and a well stocked larder. Butterfly sandwiches and roasted grasshoppers abound. And there's also Mr. Alderman Ptolemy Tortoi Beatrix Potter's books always appealed to me because food was always involved. I grew up fervently believing in rabbits and mice and frogs having well stocked larders within their homes. And the tea! Always a hot cuppa waiting on the table for the protagonists when they completed their adventures. The Tale of Mr. Jeremy Fisher comes complete with food, adventure, friends...and a well stocked larder. Butterfly sandwiches and roasted grasshoppers abound. And there's also Mr. Alderman Ptolemy Tortoise. Really, what more can one ask in a good read? A frog named Jeremy decides to go for fishing but rather ends up being attacked by a stickleback and a trout. What’s the stuff here about a lizard being named Isaac Newton. Is there some irony here that I am not able to see? This has been my favourite Beatrix Potter story for a long long time - which is amusing now seeing that I work with frogs. Which makes you notice different things when you go back and read them later. Unlike most children's authors writing about animals, she managed to anthropomorphise animals while still retaining the point about the animal. Jeremy Fisher may be wearing a mackintosh and galoshes, but he's quite obviously still a frog, and he behaves like one (although he doesn't sing, sadly). T This has been my favourite Beatrix Potter story for a long long time - which is amusing now seeing that I work with frogs. Which makes you notice different things when you go back and read them later. Unlike most children's authors writing about animals, she managed to anthropomorphise animals while still retaining the point about the animal. Jeremy Fisher may be wearing a mackintosh and galoshes, but he's quite obviously still a frog, and he behaves like one (although he doesn't sing, sadly). That makes me very happy as I reread. This one seemed like it might especially appeal to boys. Although I don't know why frogs seem like a more boy thing to me. The drawings of the frogs were beautiful. And the newt was really cool, too. I loved the "macintosh and goloshes." It seems like no one dresses for rainy weather anymore. Maybe it's because we just rush from our cars into buildings (and vice versa) and never spend any time out in the rain. Maybe I expected more of Beatrix Potter because my childhood imagination had blown it all out of perspective. Now that I'm reading her as an adult I'm disappointed. Epic fail fishing for Mr. Jeremy, haha! I wonder what butterfly sandwich taste like. hmmmm!! A fun and delightful book from the mind of Beatrix Potter. Beatrix Potter's children's stories are wonderful and timeless. The Tale of Mr. Jeremy Fisher is one of her lesser well-known stories of which there are about a dozen. The story is engaging and Mr. Jeremy is an intriguing fellow. Parts of his house are always wet and "he liked getting his feet wet; nobody ever scolded him and he never caught a cold!" Children are always being told not to get their feet wet (sometimes they're told they'll get a cold if they do). This, along with a host of things Beatrix Potter's children's stories are wonderful and timeless. The Tale of Mr. Jeremy Fisher is one of her lesser well-known stories of which there are about a dozen. The story is engaging and Mr. Jeremy is an intriguing fellow. Parts of his house are always wet and "he liked getting his feet wet; nobody ever scolded him and he never caught a cold!" Children are always being told not to get their feet wet (sometimes they're told they'll get a cold if they do). This, along with a host of things Mr. Jeremy does that one wouldn't imagine a frog doing, makes him very interesting. This is the book that taught me crazy British words, like macintosh and galoshes. To this day I still think Mr. Jeremy looks pretty ridiculous in his too-tight rain coat. Must've been a relief when that fish gnawed it off him and his toady skin could breath again. Speaking of toads, this story is also the reason why for years I thought the Adventures of Frog and Toad was written by Beatrix Potter. Oh, well. Because Bruce Handy says the scene in which Jeremy is eating a butterfly sandwich is 'proto-psychedelic... [for] opium eaters." I don't see it myself. It's just a silly adventure with some nice pictures of water lilies, trout, etc. I do like Sir Isaac Newton, Fisher's friend the newt, and wish he had a speaking part. One extra star for illustration. Pretty. Rich. Vivid. I guess I'm in a different head-space today. It came off more sweet and whimsical this time. And of course, I love the illustrations. The tale of a gentlemen. Mr. Jeremy Fisher, who tries to catch fish for a dinner party. A slow plot, and lots of difficult vocabulary, make this one of Ms. Potter's least favorite book to me. I understand all the vocabulary of course; but little ones, who are the target audience, may or may not. This review has been hidden because it contains spoilers. To view it, click here. The illustrations are really nice but the main character is almost eaten by a fish. That is just plain weird and hard to explain to a toddler. "Oh no, honey, he's okay--he just was almost eaten, that's all." Weird. Not a fan of frogs or fish, this is my least favourite of Beatrix Potter's tales.